While unpacking holiday goodies and decking the halls for the season, it’s a good idea to keep the pets in your household in mind. From curious cats to prying pups, take a took at this handy list and browse the following points. When setting up your Christmas tree, ensure that the base fits snugly in the stand. To secure the tree from the top, try stringing durable fishing line from the ceiling. That way, if Mrs. Whiskers tries out her kitty climbing skills, the whole arbor won’t come toppling down. Add a cover over the reservoir to prevent your critters from drinking the tree water. Although you’ll be regularly adding fresh water, the basin can become a harbor for dangerous preservatives that animals should not ingest. The sparkling garland and twinkling lights can entice your companions to investigate your new focal point. As you string your spruce, hang sachets of orange and lemon peels or add citronella scented oil as natural deterrents. Consider the radius of the wagging tail of your pooch. 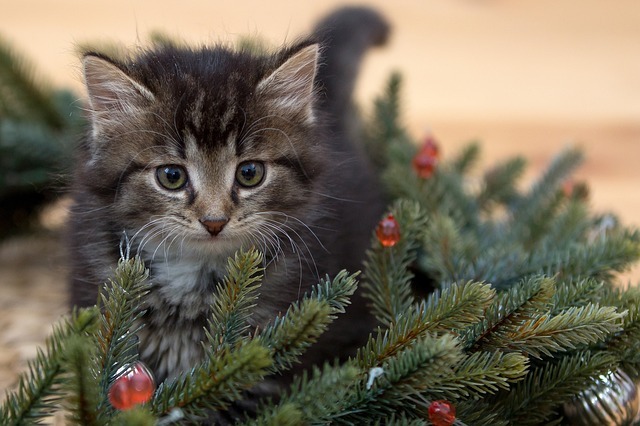 By placing delicate ornaments on higher branches, there's less chance of Rover’s happy tail knocking down the breakable decor. 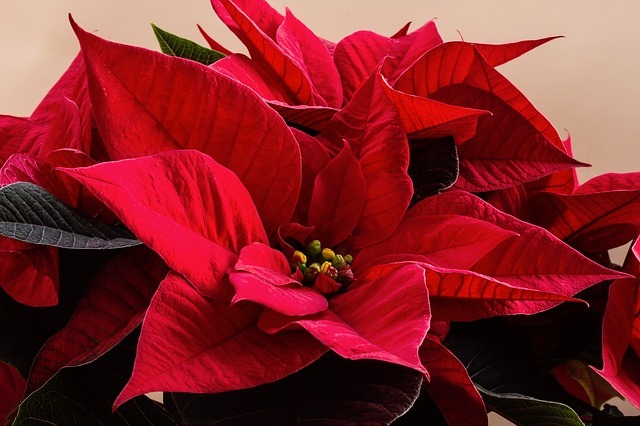 Plants like these are popular during the holiday season, but can cause serious issues if ingested by your pet. Opt for pet-friendly green and red vegetation with sprigs of rosemary and blooms of pineapple sage. The flicker of flame from a candle can bring a pleasing scent, but could also pose a risk with a prowling cat. 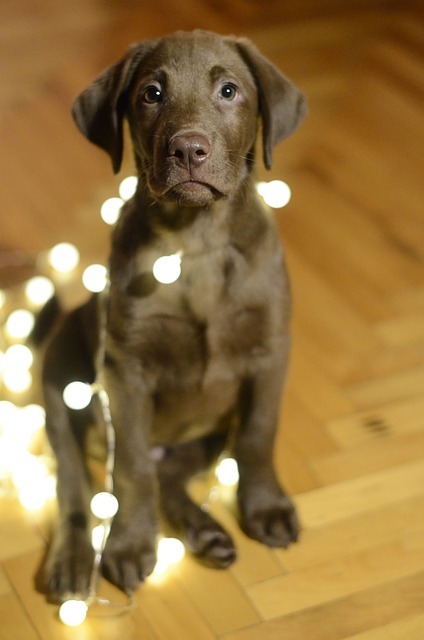 Strands of lights can add festive color, but an extension cord along the floor could tempt a dog that likes to chew. Cats and dogs will put anything they find in their mouths! Keep track of any small parts when children open their new toys. Be careful when installing toy batteries. Be vigilant to prevent your animals from choking on or eating harmful items. Serving indulgent foods is a fun splurge during the holiday season. However, ensure that the snooping creatures around your house do not partake of any of your food and drink. When inviting a visitor to stay in your guest accommodations, remind them of an important detail: your tabby or hound might investigate the toiletries your company is unpacking. Encourage your vacationers to safely tuck away their personal goods and medicines to prevent an accidental discovery by your prying pals. 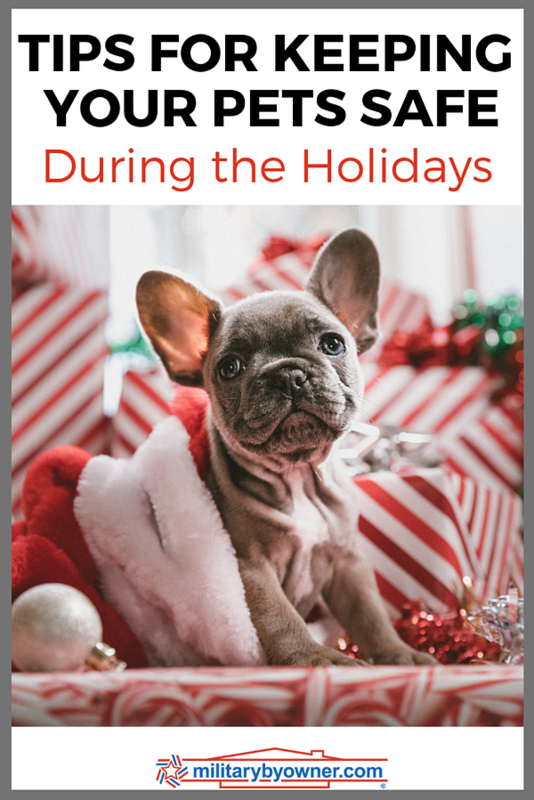 Excitement – The busy pace of the holiday season and the thrills of opening surprise gifts can add a pattern of behavior that differs from what your cat or dog has grown to know. Take notice if your kitty or canine companion seems on edge. 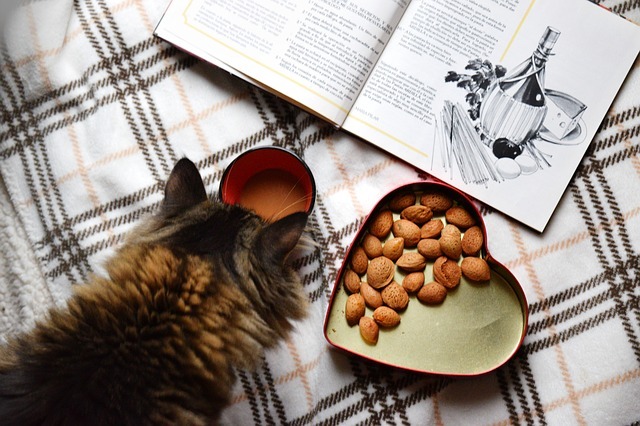 Anxiety – Preparations for visitors or squabbles with family members can also upset the normal balance of the daily routine of your furry friends. Be reassuring and kind as the creatures adapt to the holiday happenings. Noise – Happy guests. Festive music. Bursts of fireworks. These joyous moments of celebration can actually stir a sense of fear in animals. Ensure that your pets are kept safe and sound. These elements and more could trigger the “fight or flight” instinct where pets act out negatively or try to run away. For the well being of your 4-legged friends, create a quiet spot away from the surge of holiday merriment. 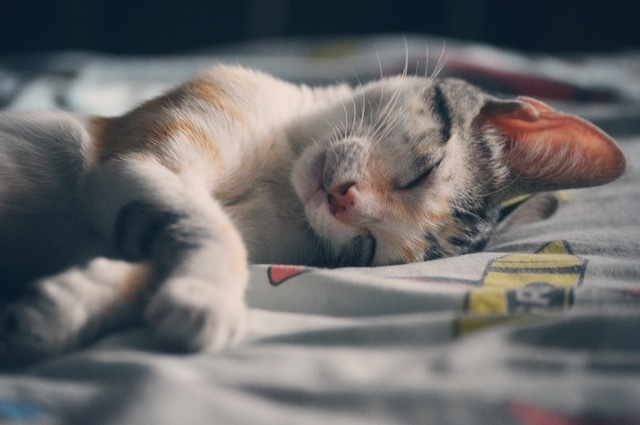 In this safe space, your pets can retreat and find rest. 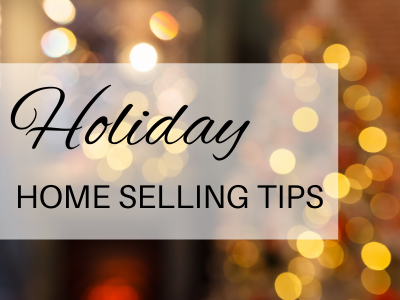 With these suggestions in mind, you can make the holiday season an enjoyable experience for the animals you adore. 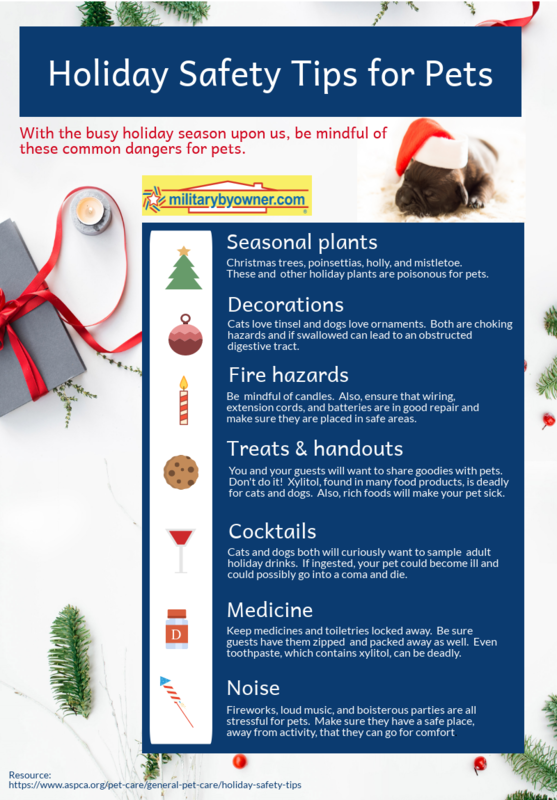 And if you’ll be traveling over the holidays without your pets, take a look at this list from MilitaryByOwner with ideas for their continuous care and comfort.